We consider Southeast Alaska sometimes called the Panhandle or Inside Passage to be the remaining area of Alaska to the South including all land belonging to Alaska around Yakutat, Haines, Juneau and continuing to the Canadian Border south of Ketchikan Alaska including any islands. Southeast Alaska includes all the cities, towns and villages listed on the left. Juneau is the State Capital of Alaska. Click a name to see more information. The Southermost region of Alaska, containing the capital, Juneau, and the former capital, Sitka; neither city being accessible by road. The Alaska Panhandle, sometimes referred to as Southeast Alaska or the Inside Passage, is the southeastern portion of the U.S. state of Alaska, which lies west of the northern half of the Canadian province of British Columbia. The majority of the panhandle's area is part of the Tongass National Forest, the United States' largest national forest. In many places, the international border runs along the crest of the Boundary Ranges of the Coast Mountains (see Alaska boundary dispute). The Alaska Panhandle is the northern terminus of the Inside Passage, a protected waterway of convoluted passages between islands and fjords, beginning in Puget Sound in Washington state. This was an important travel corridor for native canoeists, as well as gold-rush steam ships, and in modern times is an important route for ferries and cruise ships. 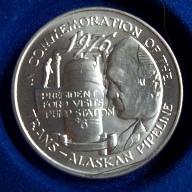 The Panhandle has a land area of 35,138(56,549 km), comprising six entire boroughs and three census areas, in addition to the part of Yakutat Borough lying east of 141° West longitude. Although it has only 6.14 percent of Alaska's land area, it is larger than the state of Maine, and almost as large as the state of Indiana. The 2000 census population of the Panhandle was 72,954 inhabitants, about 42 percent of whom were concentrated in the city of Juneau. It includes the Tongass National Forest, Glacier Bay National Park, Admiralty Island National Monument, Misty Fjords National Monument, Alaska's Inside Passage, and myriad large and small islands. The largest islands are, from North to South, Chichagof Island, Admiralty Island, Baranof Island, Kupreanof Island, Revillagigedo Island and Prince of Wales Island. 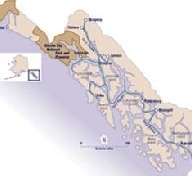 Major bodies of water of the Alaska Panhandle include Glacier Bay, Lynn Canal, Icy Strait, Chatham Strait, Stephens Passage, Frederick Sound, Sumner Strait, and Clarence Strait. Alaska Airlines is by far the largest air carrier in the region, with Juneau's Juneau International Airport serving as the aerial hub for all of Southeast and Ketchikan's Ketchikan International Airport serving as a secondary hub for southern Southeast Alaska. However, Alaska Airline's Boeing 737s can only be handled by a few airports in the region and Alaska's bush airlines serve many of the smaller and more isolated communities and villages in the regions. Wings of Alaska (based out of Juneau), Alaska Seaplane Service (based out of Juneau), are the primary carriers in the region and also offer cargo service to smaller communities. Up until their grounding by the FAA in 2008, L.A.B. Flying Service (based out of Haines), also provided this service. Numerous carriers serve other parts of the Alaska Panhandle. For example, Sunrise Aviation (based in Wrangell), provides flightseeing and chartered service to outlying areas and international charters up the Stikine River to places such as Telegraph Creek, Dease Lake as well as numerous lakes and communities in Northern British Columbia. South East Alaska includes all the cities, towns and villages on the left. Click a name to see more information.